How are wealth and income inequality linked in the US? The evolution of wealth inequality in post-war America. We live in unequal times. The causes and consequences of widening disparities in income and wealth have become a defining debate of our age. Recent studies have made major inroads into documenting trends in either income or wealth inequality in the US (Piketty and Saez 2003, Kopczuk et al. 2010, Saez and Zucman 2016), but we still know little about how the joint distribution of income and wealth evolved over the long run. In a new paper, we exploit a unique new dataset that allows us to track the joint distributions of income and wealth in the US since 1949 (Kuhn et al. 2018). The dataset builds on household-level information that spans the entire US population over seven decades of post-war American history. We unearthed historical waves of the Survey of Consumer Finances (SCF) that were conducted by the Economic Behavior Program of the Survey Research Center at the University of Michigan from 1948 to 1977. We then linked the historical survey data to the modern Surveys of Consumer Finances that the Federal Reserve redesigned in 1983. We call this new resource for inequality research the Historical Survey of Consumer Finances (HSCF). The survey complements existing datasets for long-run inequality research that are based on income tax and social security records, but also goes beyond them in important ways. Importantly, it contains the same comprehensive balance sheet information as the modern Surveys of Consumer Finances, as well as granular demographic information that can be used to study dimensions of inequality – such as long-run trends in racial inequality – that so far have been out of reach for research. A central finding of this new research is that portfolios differ systematically along the wealth distribution. While the portfolios of rich households are dominated by corporate and non-corporate equity, the portfolio of a typical middle-class household is highly concentrated in residential real estate and, at the same time, highly leveraged. These portfolio differences are highly persistent over time. An important upshot of this pattern is that relative asset price movements induce major changes in the wealth distribution and can decouple trends in income and wealth inequality for extended time periods. For instance, rising asset prices can mitigate the effects that low income growth and declining savings rates have on wealth accumulation. This was prominently the case in the four decades before the financial crisis when the middle class rapidly lost ground to the top 10% with respect to income but, by and large, maintained its wealth share thanks to substantial gains in housing wealth. 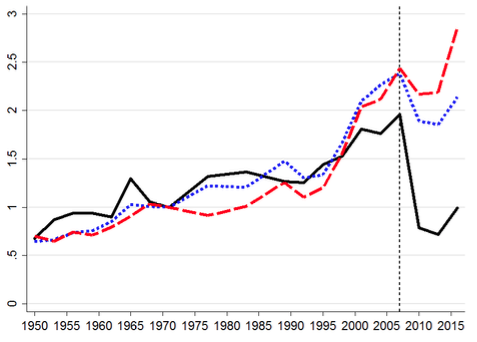 This is shown in Figure 1, which compares income and wealth growth for different groups of the wealth distribution since the 1970s. Notes: Growth of income (top) and wealth (bottom) for different wealth groups. 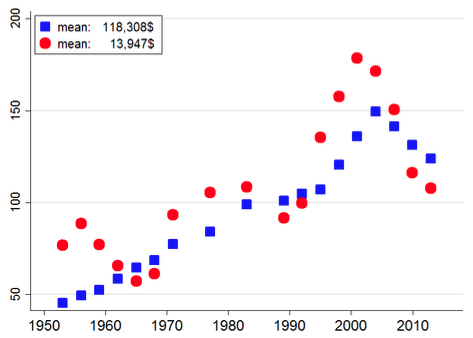 All time series are indexed to 1 in 1971. The solid lines show growth rates for the bottom 50%, the short dashed lines for the middle class (50%-90%), and the long dashed lines for the top 10%. Figure 1 shows that incomes of the top 10% more than doubled since 1971, while the incomes of middle-class households (50th to 90th percentile) increased by less than 40%, and those of households in the bottom 50% stagnated in real terms. In line with previous research, the Historical Survey of Consumer Finances data thus confirm a strong trend toward growing income concentration at the top (Piketty and Saez 2003, Kopczuk et al. 2010). However, when it comes to wealth, the picture is different. 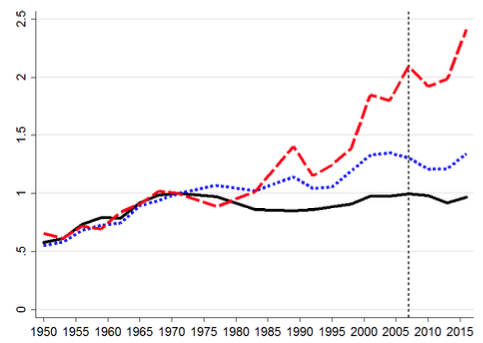 For the bottom 50%, wealth doubled between 1971 and 2007 despite zero income growth. For the middle class (50%–90%) and for the top 10%, wealth grew at approximately the same rate, rising by a factor of 2.5. As a result, wealth-to-income ratios increased most strongly for the bottom 90% of the wealth distribution. Price effects accounted for the dominant part of the wealth gains of the middle class and the lower middle class before the Global Crisis. We estimate that between 1971 and 2007, the bottom 50% had wealth growth of 97% only because of asset price changes — essentially a doubling of wealth without any saving. Put differently, for the bottom 50% virtually all wealth growth over the 1971–2007 period came from higher asset prices. Also, the upper half of the distribution registered wealth gains on an order of magnitude of 60% because of rising asset prices. From a political economy perspective, it is conceivable that these large wealth gains for the middle and lower middle class helped to dispel discontent about stagnant incomes for some time. When house prices collapsed in the 2008 crisis, the same leveraged portfolio position of the middle class brought about substantial wealth losses, while the quick rebound in stock markets boosted wealth at the top. House prices plummeted after 2007 and recovered only slowly in recent years. By 2016, they were still 10% below their 2007 peak level. The bottom 50% lost 15% of wealth relative to 2007 levels, mainly because of lower house prices. By contrast, the top 10% were the main beneficiary from the stock market boom and were relatively less affected by the drop in residential real estate prices. The consequence of substantial wealth losses at the bottom and in the middle of the distribution, coupled with wealth gains at the top, produced the largest spike in wealth inequality in postwar American history. Surging post-crisis wealth inequality might in turn have contributed to the perception of sharply rising inequality in recent years. Race is an important stratifying dimension in the US with respect to the financial situation of households. For instance, Bayer and Charles (2017) document persistent earnings differences between black and white working-age men. The Historical Survey of Consumer Finances data provide a new perspective on the long-run evolution of racial wealth inequality, which had been uncharted territory until now, as long-run data were simply not available. Figure 2 demonstrates the key trends in income and wealth growth of black and white households. In the figure, a reduction in the racial divide will show up as a stronger increase in black households’ income or wealth over time. A lockstep evolution of the series for black and white households signals persistence of racial disparities. The figure shows persistent and, in some respects, growing inequalities between black and white Americans. Income disparities today are as big as they were in the pre-civil rights era. In 1950, the income of the median white household was about twice as high as the income of the median black household. In 2016, black household income is still only half of the income of white households. The racial wealth gap is even wider and is still as large as it was in the 1950s and 1960s. The median black household persistently has less than 15% of the wealth of the median white household. The overall summary is bleak. We document that over seven decades, next to no progress has been made in closing the black–white income gap. The racial wealth gap is equally persistent and a stark fact of postwar America. The typical black household remains poorer than 80% of white households. Notes: Panels show median income and wealth of black and white households over time. We show moving averages over three neighbouring observations. Red squares refer to white household heads and blue dots to black household heads. 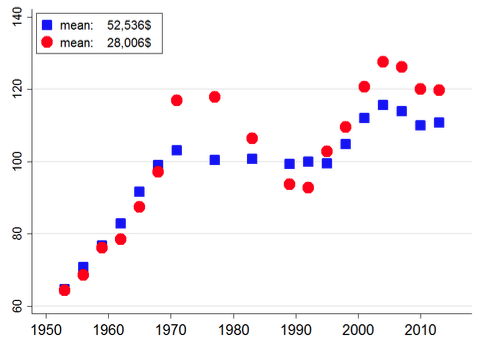 Average income and wealth levels for 1983-1989 (in 2016 dollars) are shown in the legend. A key finding of our research is that asset price dynamics have been a key driver of the evolution of wealth inequality in postwar America, though they have attracted little attention to date. Asset price changes induce shifts in the wealth distribution because the composition and leverage of household portfolios differ systematically along the wealth distribution. An important consequence is that the top and middle of the distribution are affected differentially by changes in equity and house prices. Housing booms lead to substantial wealth gains for leveraged middle-class households and tend to decrease wealth inequality, all else being equal. Stock market booms primarily boost the wealth of households at the top of the wealth distribution as their portfolios are dominated by listed and unlisted business equity. Portfolio heterogeneity thus gives rise to a race between the housing market and the stock market in shaping the wealth distribution. Over extended periods in postwar American history, such portfolio valuation effects have been predominant drivers of shifts in the distribution of wealth.